I'm going to start off my reviews of website providers with a provider that caters to artists and jewelry artists, Artspan and Jewelspan. Artspan started in 1999, geared more towards painters and other types of art, and the sister site, Jewelspan, specifically for jewelry artists, was introduced in 2013. Jewelspan offers a slightly different feature than other website providers...in addition to your personal Jewelspan website, shoppers can also go directly to Jewelspan's shopping site and view the work of many different artists. There is a 10% commission paid to Jewelspan if someone finds your work and purchases through their shop. If customers purchase directly from your Jewelspan website, there is no commission. 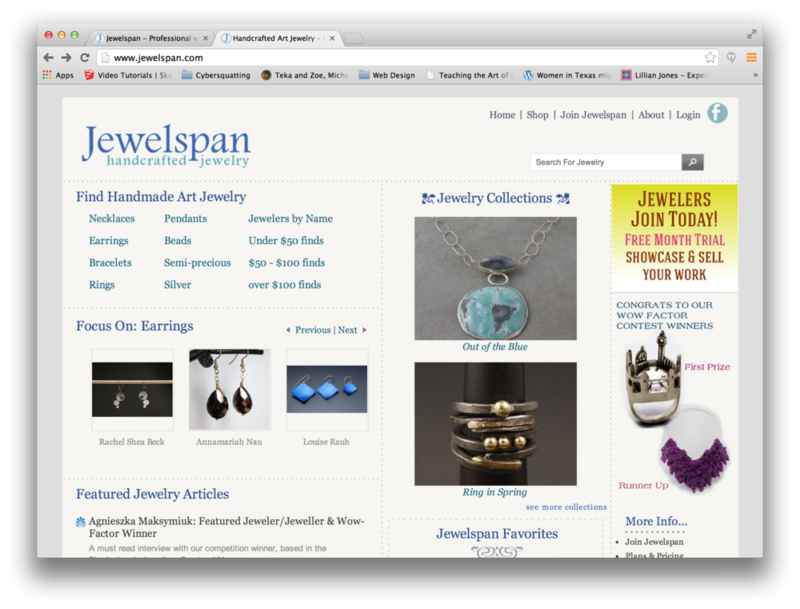 Jewelspan features individual artists on their main page. The main Jewelspan site sports a clean layout, nice typography, and professional photos from artist websites. According to their website, "Jewelspan offers one-stop shopping for collectors of quality artisan jewelry and access to a community of jewelry artists who are serious about what they do. This is not a clearinghouse for handmade goods, it’s a collection of unique jewelry-artist websites, customized and individually branded." It acts almost like an Etsy-style site, where artists have their own "shops." Jewelspan takes a 10% commission if someone buys your item through their shop, but if someone purchases through your individual site, there is no commission. There are two different plans, a "Jewelspan Professional" plan, which allows the artist to display unlimited items, for $149 a year on an annual contract, or $14.95 a month, billed monthly ($179.40 a year). "Jewelspan Standard" allows the artist to display only 15 images, and costs $119 a year on an annual contract, or $11.95 a month, billed monthly ($143.40 a year). You can expect that all providers will give a discount for paying annually. 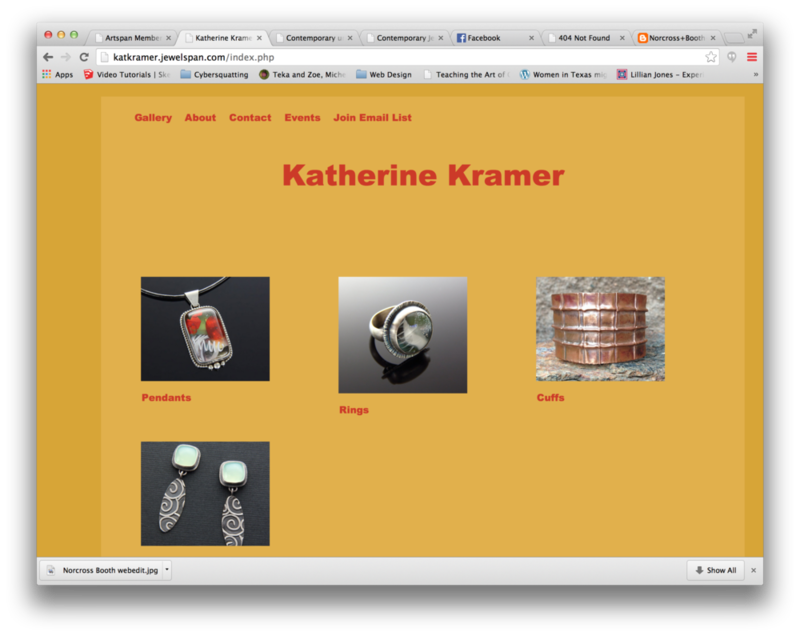 You can obtain a free Jewelspan "subdomain" that looks something like this: http://katkramer.jewelspan.com. You can obtain a domain name through Jewelspan for $15.89, which is an annual fee. You can check on Jewelspan's site to see if a name is available (see my other blog post on domain names for more information on domain names). Both options are "totally customizable," and they have over 100 "one-click" designs. eCommerce is integrated into either option, although mention of any transaction fee or credit card processing fee is not listed in their pricing or features. There are additional images for each listing...up to three...with a zoom feature. Images are displayed with thumbnails. The accounts come with social media integration...there is a Social Media Setting page where visitors can go directly to your social media accounts. You can also allow Pinterest "Pin It" buttons and "Like" buttons for liking your individual images on Facebook...but it's a setting that's turned off by default. They have some interesting features like an option for web visitors to sign up for notifications when you upload new work to your site. There is also an opt-in email list feature, but it doesn't mention integration with MailChimp or ConstantContact, two of the major email marketing companies. It does let you see email stats from your promotional efforts, and view web stats on your site. You'll also get web-based email. Jewelspan's comparison page also says that your pages and images are optimized for Google. You can also install something called Google Analytics that will let you do in-depth analysis of your pages. For example, you can figure out if people are viewing your site from their mobile phone or desktop, what computer they're using, and even demographics. You have to register for a Google Analytics account to do this, then insert code back into Jewelspan. They give a 30-day trial...you have to give your credit card, but it's not billed until the end of the trial period. That's a little longer than most providers. Okay, so here I go. I'm signing up for a Jewelspan account. I could not find any comparison chart with the specific differences between the Professional and Standard versions until I clicked the signed up for the 30-day trial and provided my personal information. Most sites will give a comprehensive list of features before you take that step. So I gave my billing information (which they say won't be charged until the end of the trial period), then I'm prompted to either choose a "free subdomain," a new domain, or indicate that I'm using my existing domain. For a new user, it's probably easier to have Artspan handle obtaining a domain name if you don't have one already, and worth the extra few dollars to have a single entity handling your website. I'm not sure if Artspan provides privacy block as an option, but I'm sure that if you contact their Helpdesk they can make that happen. There is also some marketing information at the bottom to ask how you heard about Jewelspan. If you are referred by a member, they get a free month. I got a confirmation thanking me for signing up. There is a login button on the bottom of the page. Here we go! The main control panel is nicely organized, and seems pretty straightforward. I didn't notice them first, but there were some colorful buttons at the bottom, and I clicked the Getting Started button. (I later noticed that these are duplicates of the buttons at the top, which are always available). There are some how-to videos and written instructions about how to get started making your site. One nice feature is that you can click a "browse" button to upload images, or simply drag and drop them into the window. It's also optional that you give description information, so it can be added later. There are also links to send a Helpdesk email or submit a ticket if you have a problem. I used the image upload to add some of my images. That was easy enough. I went ahead and added titles, but decided to add descriptions later. Next, I added some "Galleries." These would be the equivalent of your "main categories" from the previous blog post. I added Pendants, Rings, Cuffs, and Earrings. I decide to check and see what my site looks like! Oh my! That's colorful! I'll have to tackle the colors and design here shortly. I just have to remember it's a work in progress. But there is an issue...the first thing I noticed is that there are no images to go with the categories, and the titles are duplicated. The first thing I noticed is that there are no images to go with the categories, and the titles are duplicated. Let's see if we can correct that. I go back to the Gallery page, and click on the green Add button (I tried double-clicking on the Gallery item at first, but it didn't work). Then I ended up in a Galleries page, which would allow me to change the name and a Short Description....this is the "duplicated title" that I saw. I removed the second title. Then clicked to add an item to the Gallery from the list of images below, and it populated the Gallery photo box...easy enough. I added the rest. Next I went back and started adding the rest of my photos. A nice feature is that Jewelspan tells you how much time there is left for your upload, and there is a box to watermark your photos. Jewelspan recommends that artists do NOT watermark their photos, and I agree with that. You could add a small watermark yourself, but having one that overlays your photo is distracting from the beauty of your piece. Next, I went to the gallery to change my main category photo. 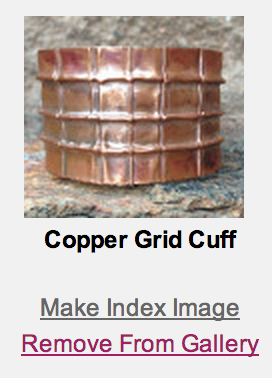 I noticed under each image there is a "Make Index Image" option, which promoted this image to be my main image. Notice that you can also remove an image this way as well. While in the Gallery page, I noticed that I can also add items to multiple categories. A nice feature. For example, you could have a beaded necklace that falls into a "Beaded" Gallery" and also your "Necklace" gallery. I went ahead and added the rest of my jewelry, and added it to the appropriate galleries. Let's see where we're at. The Jewelspan site with the four categories added. Next, I decided to add some pages to my site. There are three default pages: Gallery, About, and Contact. I found a Website Pages link on the left side of the page. This page is pretty straightforward...and very drag and drop. The three pages at the top are your three default pages. Simply drag the pages from the bottom to the top area to add them. Drag pages from the top to the bottom area to hide them. I dragged the Events page to the top, then clicked Edit. I was presented with a blank Events page on my website with a standard HTML editing bar. I added a table, then added some pictures and text to show some events we've attended. However, I didn't click "Save," and at one point my session timed out and I lost my work. Lesson learned...SAVE FREQUENTLY if you're in this editing mode. After I recreated the work, I clicked the Preview Changes button at the top, and viewed my progress. It's a little basic, but I still haven't applied a style. Next, I edited my About Me page. Again, I was presented with a blank page, and I added text and a photo. One hidden trick with this HTML (web code) box is that you can add a photo, then choose the "Advanced" tab and align the photo on the right or the left. A trick you can use to make the photo have space between it and the text is to use the "horizontal space" function. Add 15 pixels of space, then if your photo is aligned right, remove "margin-right: 15px;" from the field below, or if it's aligned left, remove "margin-left: 15px;". This will align the photo and give it space. So next I wanted to add shopping cart functionality. First I went to the Sell Art/E-Commerce button, but that option just gave me some settings like Sales Tax and Shipping. It directed me to the Artwork Library under Website Items to set up items. I chose an item, added a description, a price, chose categories and keywords, enabled the Add to Cart Button, and checked the "New Work" button to have an email sent to my subscribers. 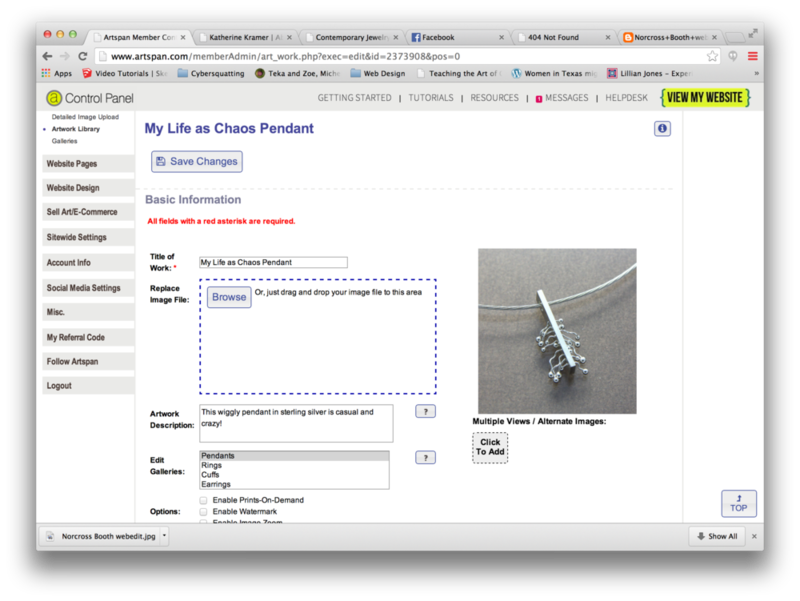 If you want your item listed on Artspan/Jewelspan, then click that button as well. Click the slideshow below to see the site's pages in the Jewelspan's "Tangerine" style. We'll change that in a minute. Okay, time to tackle the look of the site. The yellow orange is actually growing on me, but let me see what else is out there. I think the red Helvetica Black title is a little too heavy for my taste, but Jewelspan will let you change these details. The slideshow below shows some of the design and layout settings, and some variations on my Jewelspan site. On one variation, I add a colorful background. Also notice that when you choose a style, there is a preview in the lower right that shows the results of your choice. And finally, I looked into the email/newsletter settings. You can go into an admin page on Jewelspan/Artspan that will allow you to compose a newsletter with photos and even videos, then send it through their website. Since this appears to be a free service, it may be more cost effective than other email services, and it's integrated with your Jewelspan site. I was pleasantly surprised to find one of my items featured on Jewelspan's main page a few days later, and also included in one of the "Collections" pages. It threw me off at first...I saw a picture of one of my rings, with a title under it that was not the name of the item! But then I realized that it was being used as the thumbnail of a Collection. Jewelspan has a variety of templates available. 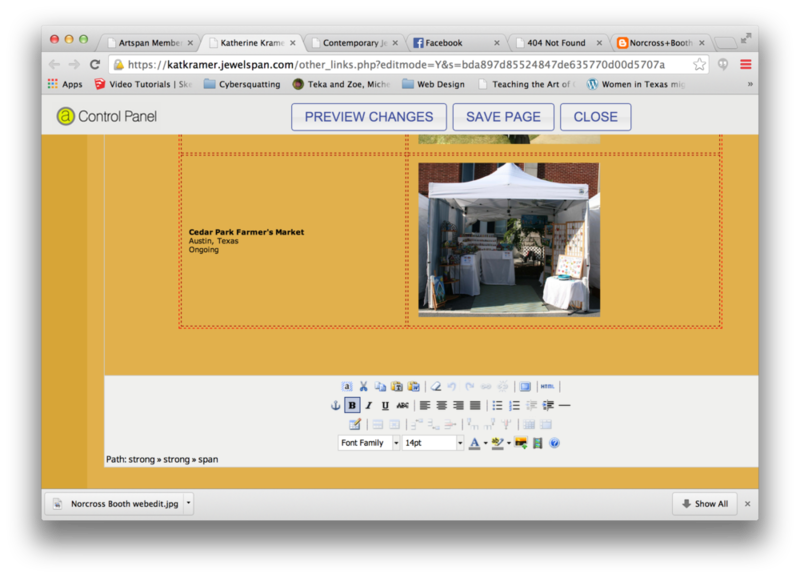 Artists can "dress up" the templates by choosing their own colors, fonts, and background images. If you change the template, I would recommend that you use a color wheel or color guide to choose a complementary palette. It's easy to go crazy with color and end up detracting from your jewelry. Also, stick with basic, clean fonts...not all computers have all fonts...I would recommend avoiding script fonts altogether. My personal opinion is that Jewelspan's templates are fairly basic and the layout a little dated, but you as an artist can adapt the layouts as you wish. Jewelspan incorporates eCommerce, and you can be up and selling your jewelry quickly. There is the added benefit of including your items in a larger online shopping site. Although Jewelspan claims that their layout is "mobile friendly," it is not. A site that is "responsive" and written correctly for tablets and smartphones will reconfigure itself to make it easier to navigate. If the user must zoom in to interact with the site, it's not optimized for mobile. Jewelspan needs to implement this change to compete with other offerings. Jewelspan will allow you to use an existing domain name, or will help you obtain a domain name through their site. Search engines will use text on pages, or the artist can add descriptive text to help their site rank higher in search engines...it's important that the artist take the extra step to add information to the meta description. You can link your social media to Jewelspan easily. Visitors can also "pin" your photos to their Pinterest. couple of other great features of Jewelspan include the ability to create a newsletter and send it from within Jewelspan and the ability for visitors to add themselves to a new product notification list. In full disclosure, I'll take this opportunity to point out that I have no affiliation with any of the companies I'm reviewing. I did approach Squarespace to ask if I could have access to a testing account for teaching, and they refused. They offered me the same 10% coupon they offer any customer. I chose Squarespace because it met all of the requirements on the list, but I can also speak without bias about all of the options discussed in my blog.